The Prop. 65 label should be taken in context, understanding that the science isn’t yet settled. But more caution about this ubiquitous chemical does make sense. But the giant company has its own credibility problems. In the 1990s, it had to pull false and misleading ads claiming that Roundup was “biodegradable” and “practically nontoxic.” And the regulators at California’s Office of Environmental Health Hazard Assessment are serious scientists who have warned Californians away from scores of chemicals in the absence of federal action. So from a consumer standpoint, more information is better, and a little more caution among farmers and gardeners is overdue. 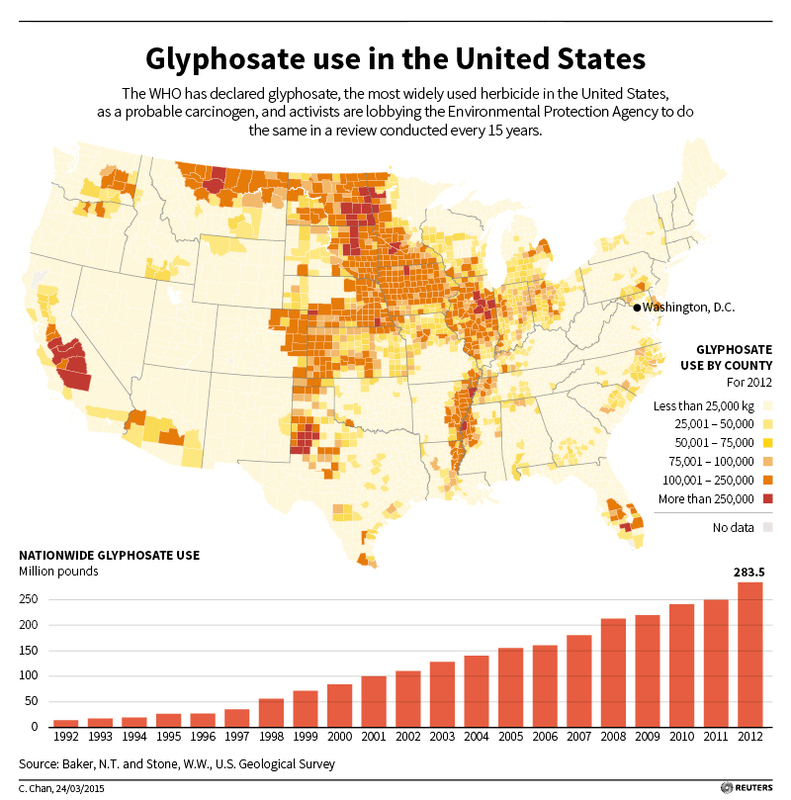 Developed in 1974, glyphosate boomed after Monsanto began genetically modifying commodity crops to resist it, so that farmers could easily use it to kill weeds without killing their crops as well. The herbicide dramatically improved yields and simplified farming, and for many years displaced other, more toxic weed killers. But the relative safety has encouraged farmers, municipalities and homeowners to use it far too liberally, with too few safeguards. Now overuse of Roundup has created a generation of Roundup-resistant superweeds; that, in turn, has prompted many growers to return to old, more toxic weed killers or, worse, mixtures of herbicides with unknown health risks. Two years ago, amid concerns about links to non-Hodgkin’s lymphoma, a respected scientific arm of the World Health Organization reviewed decades of research on glyphosate and determined that, on a scale of possible to definite, it “probably” is carcinogenic. Since then, Monsanto has been beset by cancer lawsuits, at least one of which yielded evidence that the company may have paid academics to sign off on research ghostwritten by Monsanto. Internal correspondence also suggested that a now-retired employee within the U.S. Environmental Protection Agency was working on the company’s behalf, trying to quash reviews of glyphosate. Monsanto denies both implications, and if anything, the situation cries out for more independent investigation. Life, of course, is risky. But California is right to let consumers know that gardening gloves and appropriate gear around chemicals may be in order, along with maybe tackling some of those weeds the old-fashioned way – by pulling them. Note: An earlier version of this editorial misstated the status of the state’s intention to add glyphosate to the Prop. 65 list. Glyphosate will be added to the list pending an appeals court ruling on Monsanto’s request for a stay.